Makeover Takeover is upon us. Here’s what’s happening: starting October 20th or so (as soon as this baby comes) I’ll be wanting to take it easy work-wise. It’s business as usual on all fronts but I’m trying to figure out how to limit my work load for a couple months. Enter ‘Makeover Takeover’. As you know blogs don’t run themselves, content doesn’t create itself and I’m not just shutting this sucker down. So instead I’ve tasked my team to design, style, document and shoot the redesign of their own homes. I’ll have less work/designing/writing to do, you get really good makeover content, and they get some perks and good portfolio work for themselves. It’s a win, win, win, win, win. And its all starting now. When Emily approached me about designing my new apartment for the blog I was ecstatic, but mostly terrified. Ecstatic in the fact that she entrusted me to design a space that we would feature on the blog allowing all of her readers into the design process of my space and each and every step. But, terrified that it would be chronicled on the blog and every winning decision or mistake I made would be there for all of you to read through. Trust me folks, there will be mistakes, and I can assure that there will be moments where you think, what the heck is he thinking putting those side tables with those lamps, or that art with those sconces. But, there is a method to my madness, or at least I am pretending there is. I wanted something masculine (obviously), something graphic, something rugged, and something that seamlessly incorporated old architecture and pieces with new modern and architectural lighting and accessories. After I had decided on general direction it was on to picking out some new pieces of furniture that would go with the few pieces that I wanted to keep after my move. Once upon a time picking out furniture for your home meant either running to your local department store to find a pretty limiting selection of options or flipping through piles of catalogs where your eyes melted out of their sockets while perusing through all those beautiful glossy pages as you tried to imagine what that leather chair would look like in your space, or how the L-shaped sectional would fit around your already existing coffee table. You then had to find the little tiny letter that corresponded with the piece you liked and follow it down to the bottom of the page where the fine print was worse to read through to find dimensions and prices than the ingredients in your favorite breakfast cereal. Flash forward to today, where we have about 1.5489 gazillion online retailers with about 89.4057 trillion options from each of them (completely accurate numbers – feel free to fact check). It is overwhelming, it is a lot to process, and it is just stressful. The product images can be dated, the fabric selections can be limiting, and the prices can just be frightening. As much as I wanted to keep the sofa that I found for $30 at a thrift store in Utah, the peeling fabric and wannabe solid construction had seen its day and it was time to go. So, I was on the hunt for something affordable, well designed, and customizable. Right around this time a company that encompassed all three (and more) reached out to introduce themselves and that is when Interior Define became the answer to all my questions, besides the ever looming question of why I am still single. If Interior Define were a man, I would be fully satisfied with my life and everything it has amounted to throughout these 27 years of my existence, sadly they just make furniture, so although their furniture does not have human arms, I am sure that one of their sofas will act as my shoulder to cry on after the many terrible first dates my future holds. I digress. Interior Define is new to the game but they are big time players, they offer a well curated selection of sofas, sectionals, and chairs which are all fully customizable and 30-40% less in cost than any comparable retailers. Not only do they have a great website to view everything but you can also discuss anything over the phone with one of their designer consultants or in person at their new storefront in Chicago. As I began to refine things down and pull products together I made some decisions (still am making decisions) and pulled together a moodboard with some of my instinctual favorites. By instinctual I mean, my dream products that I would most likely cut of my two pinky toes, or donate my kidney for, or possibly trade my first and second boyfriends for. Basically a dream board which would then inspire my decisions as I came off my dream cloud and back down to design reality. I had decided on a color palate, and I had decided on the fact that I wanted a dramatic and dark space, seeing as how I had floor to ceiling windows and got a lot of natural light in the space. Lastly, I had decided that I wanted it to lean more masculine and more colorless than some of my previous spaces. Now, don’t get me wrong. I LOVE color, I don’t think Emily would have hired me if I were a colorless, gothic soul, that sucked the life out of her designs. But, I was ready for a more adult, refined space which I had always dreamed of living in. The process of choosing a sofa is not easy, let alone picking one out online. Luckily for me, Interior Define has a wide selection of amazing fabrics to customize whichever frame you fall in love with, an insanely easy and user friendly online shop, and they send through these very handy cards which show the shape, size, and dimensions of each of their products with a plethora of sample fabrics. I was torn between wanting a more modern sofa to juxtapose the worn leather club chairs that I was also on the search for, or going with something more traditional, that I knew I would love for years to come, but maybe didn’t have the clean modern lines of the latter. So naturally, I drafted them both up in some moodboards, to see visually which appealed to me more. Decisions, Decisions. The first option had their very modern, and very simple and clean lined “Gray” Sofa. My first instinct was that I liked it but I was not sure how practical it was with the low back and the big chunky arms. Option two was their “Rose sofa by The Everygirl for Interior Define” sofa, which is their version of a traditional english roll arm sofa. I have always loved that sofa style especially when they are upholstered in more modern fabrics, so I decided to throw it up in the moodboard even though I thought it may lean a bit too traditional with all of the other more masculine and traditional items I already knew I wanted or had. Once I had the second option for the sofa in the board, I instantly started liking the way that the room was coming together. It worked well with the wood elements that I wanted as well as the more harsh and masculine iron, brass and metal elements that were in there. Lastly, the higher back, the curved arms, and the wood legs were all what made it a winner for me. I worried that the more modern sofa would be too boxy with the big metal and antique mirrored credenza and that things would just start feeling too heavy especially with the dark gray walls that I wanted. Next was deciding on fabrics, which with all the good options they have became a very difficult decision considering as how they just introduced 50 new fabrics into their arsenal. I was swayed between two options. 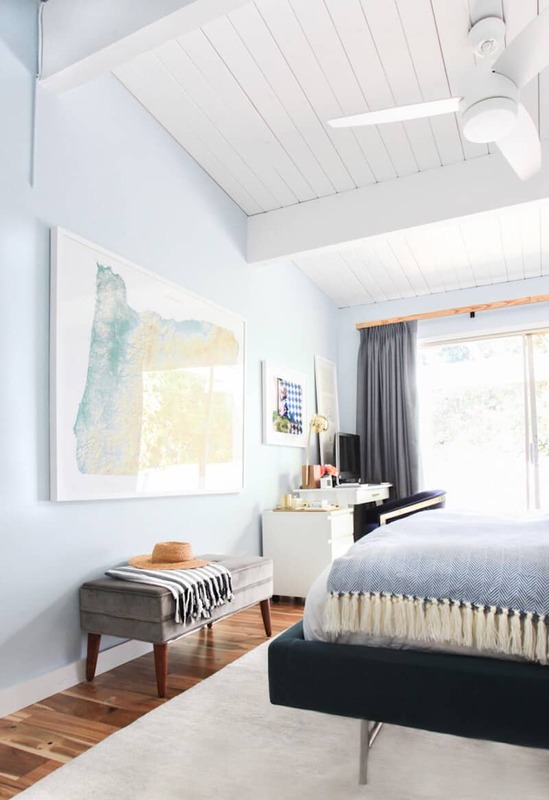 Do I go dark and monochromatic and stick with a gray to play with the walls, the linen curtains, and the pull out the gray stripe in the rug. Or do I go light and more taupe or beige to pull out the warmer tones of the wood, the creams of the rug and to pop more off the soon to be gray walls behind it. I am still torn between the two color options, but as it is right now I am leaning towards a gray fabric choice in a more modern fabric weave. Not only that but because we all love beautiful free stuff we have teamed up with them for a BIG giveaway. One lucky winner will win a $1000 online credit on Interior Define to shop for any sofa! 4) Comment back on this post with the link to the piece you’d buy with the credit if you won! Giveaway Rules: The giveaway is open to US readers only, and the $1000 credit must be used in a single transaction toward the purchase of a couch before 12/31/15. The entrant must register their email address and the giveaway ends on 9/30/15. The giveaway winner will be randomly selected from the comment section below and we will email and announce the winner directly on this post. A big thanks to Interior Define who sponsored this post as well as all of our other collaborators who allow us to create original and interesting design content for you. Don’t forget to come back soon for more updates and makeover takeover magic. All photos by Jessica Issac for EHD, and all thoughts and words by Brady Tolbert for EHD. I love the Henry sofa! I love the Rose sofa in graphite! I LOVE the Rose sofa! Love Interior Define! The Harper sofa is seriously gorge. I would definitely pick Rose in Graphite – LOVE it! Great furniture! I’d go with the Rose, in Cerulean blue. Sloan in graphite would be so perfect for our living room! I would get the Sloan in robins egg felt. What fabulous new content! Excited to see how your room will turn out Brady! I loved that it’s on casters so easy to rearrange the room at a moments notice. I would totally get the Walters Sectional in a natural hue. Can I beg them for a caramel colored leather option on any of the sofas? I would choose the Rose sofa in stone or cerulean blue! Love this company. I’d get the Harper in Dove! I have the exact sofa in a lighter linen and love it!!! SOOOOO comfy and it’ll last for years. Congrats…the room will be stunning! Such great insight into your design process! I love the Lucy! http://www.interiordefine.com/shop/lucy-linen-218#NT-3385-96 Either Charcoal or Midnight blue would reaaaaaally help out my living room space. We live in a rental and everything–our couches, walls, and carpet–are pretty much the same color! Then again, the steel is quite classy too. The Crawford leather L sectional would be my choice. This post was timely. We happen to be looking for a leather sectional right now. The Walter, Sloan and Owens sofas with chaise also look nice, but we may need the seating area of the larger Crawford sectional. I love the Henry sofa – it looks so comfortable and easy! A sofa my beau and I can snuggle/sleep on together = priceless. I would love a sofa! The Kelley sofa is beautiful and would be perfect for our home renovation. So glad to find this site! The Asher sofa with chaise would be perfect for us. We need more seating for movie night!! This would be a great start to having an EH inspired lower level family room!! PS…..LOVE this new content!! Super exciting. Great job Brady! Can’t wait to see how it all comes together. Oh my goodness, the coolness at Interior Define! Thanks so much for sharing with us your go to shop! I’ve perused the entire inventory and decided that I LOVE LUCY!!! In fact, I will take two and have them face each other for double the love. 🙂 I love the sleek arms and high backs and she sure looks comfortable! Thanks EH, you’re the best! I love the Sloan in slate! Sloan in Graphite is a winner! I’d go with the roll arm too! I love the Lucy- in midnight blue!! I love the Sloan sofa in Coal!! I would love the rose sofa! Thanks for the giveaway! Your timing on this posts is impeccable! I’m shopping for a sofa right now, so I signed up on the email list. . . I think I’d have to choose the Lucy or the Rose in a charcoal color. Loving the Alice swivel chair! Oh does it have to be a couch? I am dying for two of their Alice Swivel chairs in the ivory heavy cloth! But would also love the Rose in sailcloth! Love the philosophy and model of Interior Define! I’m torn between the Sloan couch and the Rose couch for our living room – so many great options! I love the look of the Owens sectional with the Ash custom fabric. Rose is elegant in the Cinder fabric. We gave away two of our sofas during our transitional move and need to buy new before Christmas – it would be truly wonderful to win this before we move into the new place – thanks for the chance! Gee… I sure would love the Henry in steel, to replace the worn and stained faux suede blocky sofa in my otherwise lovely bungalow-sized eclectic mid century artisan pottery living room! I would love the Asher sofa for my living room update! Love the Sloan sofa with chaise! Love both sofa options, I agree it’s a tough call. Honestly, I’m not sure which one I like more. Wow I am very impressed with their prices. I would buy the kelley with the right chaise! Love the Harper sofa. Would be perfect in my apartment! I love the Rose! It would be amazing in my living room! I am only slightly obsessed with the Sloan sofa with left-side chaise in midnight blue for my not-so-formal-because-I-have-kids living room. We moved in a year ago and the furniture from the last house doesn’t fit as well but we haven’t found something that’s worth replacing it with. The Sloan might be! I LOVE the Rose in Cerulean Blue. The rose sofa! I love it! I would just love a new sofa for my space. Still using my old brown ones from our wedding over a decade ago. The Asher sectional in Ash! I love the Rose sofa!! I’ve been wanting to replace the brown corduroy sofa my husband bought when he started grad school, and I think we might actually be able to agree on the Rose in a nice taupe-y shade. I LOVE Lucy!! I would order 2 Lucy sofas for my family room. Probably in ivory or steel. So clean and polished looking! And a great price with down! Can’t decide between the Sloan sectional and the Walter. Both are lovely! Rose sofa all the way! Like a classic pair of wool trousers or leather oxfords, the sofa will never go out of style. The modern sofa is trendy and IMO the shape will get tired sooner than later. And a sofa is a very expensive piece to update — you can swap out a chair on a budget (well, maybe not that lovely leather chair!). I also agree that with all the other pieces, it’s boxy boxy boxy. I don’t think there is any piece at Interior Define that I don’t like, but I love the Kelley sectional in ivory. I wonder how well the color would hold up in my house!? Love the kelley with the left chaise in charcoal! I’m right there with you, Brady. The Rose is beautiful. I also have had perma heart eyes for Rose for quite a while now, either in cerulean blue or graphite. Trying to make do in my new home with my parents’ plaid country hand me down sofa and a slipcover, but this girl is dying for something with style!! Good luck with your makeover! This post couldn’t be timed better. Definitely the Crawford Sectional in leather for me. I just ordered a bunch of leather swatches from their site to pick the perfect color. Can’t wait to see them in person. Ugh, I NEED the Rose sofa! I like them all, even requested swatches… But I chose “OWENS”.. very sleek!! Rose, a rose, my kingdom for a rose!!! I love “Rose” in sand linen. It has my name written alllllll over it – please pick me! The Rose sofa is beautiful, and I can just imagine it in that wonderful Cerulean Blue! Thank you for introducing us to Interior Define! I would love to have the Sloan in Coral. I love the eclectic look of the Rosa sofa. The Cerulean Blue fabric with the detail of the legs and castors….so lovely. That Owens sectional is unreal! This Kelley sofa in ivory is like a cloud! I’d love to sink myself into that for a lazy Saturday of lounging. I really liked the lines of the Kelley sofa. I am in Chicago so this is a show room I will make time to stop in and see. The Sloan with chaise! In something super durable… Performance felt?? I’d love to replace our old hand me down sofa with the rose! Ainsley in 93″ would be perfect–it looks so comfortable! My nephew’s music room has no place to sit to listen to him play, and the GRAY in robin’s egg looks like just the ticket. What great pieces they have — it’s hard to choose! I’d go with the gray or the asher sofa for a lounge library space! This would be so fun to do! I’ve never had the privilege to even consider something like this. The GC would be such a wonderful, exciting thing to win!! Sloan, Kelly and Rose are all favorites of mine! Maybe Lucy!? I can’t decide. Love the Rose! I can’t wait to see how it looks in your living room! I like the Sloan sectional with right arm chaise. I’m leaning more towards the first couch, def more #masc. Loving the color scheme for the room though! Can’t wait to see what all you come up with. I would choose the Rose roll arm sofa in Cerulean blue – so beautiful! I’d love the Sloan for my new living room! For Brady’s room, I like the classic rounded-edge Rose sofa in a lighter color, for a slightly unexpected but inviting place to land in the darker, masculine space. I can’t wait to see how it comes together! For myself, I would pick the Sloan sectional in Cerulean Blue. Thanks for the giveaway. Brady – really enjoyed the post. Loving the new content – great job! A couple of those Alice Swivel chairs would be perfect by the fireplace in the library… once I get a library. Definitely the Rose. http://www.interiordefine.com/shop/rose I dream often of a new sofa, but money’s tight for a couple years! I would love love love the Kelley! We spent way too much money on an ugly dark gray sofa from Basset that has held up pretty poorly to daily use. If we could do it over again, it’d be Kelley in that natural heavy cloth…sigh.. I absolutely adore the Rose sofa. As a matter of fact I have had my heart set on this style for a very long time after having looked at so many Pinterest boards, blogs, magazines etc. I would so love to replace my current oddly shaped “wedge” sofa from 15 years ago. What on earth was I thinking when I picked that thing? Anyway I adore the lines of the classic English sofa. It , to me is timeless and perfectly proportioned.I love your mood boards Brady! I am looking forward to the final product! you had me at ….rose, in cerulean blue of course. The Walters in the 91″ length in black or ivory. Hi Brady, I love your mood boards. I can’t wait to see what’s next. I would choose the Lucy sofa. For me it’s the perfect mix of traditional with clean lines. As far as the fabric , I’m not sure because if I win, I’ll have to redo my whole living room! Thanks for the chance to win. Love your mood board! I love your choice of the Rose sofa and if I was the lucky winner that’s what I’d put the $ towards! Keeping my fingers crossed. Cannot wait to see your room all completed….it’s going to be great! Love the mood boards Brady, can’t wait to see it all come together! Interior Define is awesome – The Alice Swivel club chair would be PERFECT for my living room – I think I’d go a little bold and pick Robins Egg vibrant blue/green! I would love, love the Alice Swivel chair for an empty corner in our master bedroom! I would love to have this Sloan sofa in my new living room. It would be a touch choice between the lighter linen and the bold coral colors for fabric. Fingers crossed! I’d buy the Rose sofa if I won! I’ve had my eye on her for about a year now! Thanks for the opportunity! I love grey sofas, I’m going to sell mine but in the process of looking for a new one I find myself only attracted to other grey sofas! Ha what a dilemma. Wow! Loved your blog entry. Loved Interior Define. Have to agree, the Rose couch is perfect. Love the fitted back — inviting for lots of pillows and a nap! Thanks for helping us make the connection; will visit when at my daughter’s in Chicago. I’ve always wanted a sofa with a chaise and never could get myself to pay the cost… until now. Wahoo! $1000 towards the SLOANE baby! The Gray sofa would look so fabulous in my new lounge room with the terrazzo floors and double sided stone fireplace. In Tumeric even! Love that Interior Define is changing the game for furniture shopping online – and their Harper sofa in Dove would transform my front room! Love this site! We just moved into a new house, and need a sectional for our living room. This Walters Sofa is beautiful and would be perfect for us. Love the clean lines and simplicity. I hope I win!! Fabulous post, Brady! You are a wonderful writer. Love the direction you’re taking on the room. Not sure if my comment went through… so one more time!!! The Crawford in Robin’s Egg is the EXACT couch I am searching for. Perfectly timed post! I am loving the Ainsley with the left arm chaise. Love love love. Just visited their showroom last weekend- they did a great job with it. Love the Gray, Walters and Asher! Sloan in Coal would be the perfect couch for us! It is so pretty! The Rose! Hello, so classic and pretty. I would pick the Rose in midnight blue. Lucy in ivory or steel! Just purchased our first home and we’d love the Sloan as our first new pet sofa. Just purchased our first home and would love the Sloan as our first new pet sofa. The Rose sofa is amazing! I love the Henry sofa – what a great bunch of sofas!! ASHER SOFA! I think I’d get it anyway, even if I didn’t win! So, I’m sure this will be lost in the sea of comments, but I visited the Interior Define showroom recently and wasn’t that impressed. All the sofas were super low to the ground with short backs, they were stiff and uncomfortable, and the fabrics on the floor models seemed cheap and scratchy. I like the Rose couch in Graphite grey! the Rose for sure, in sand, cinder, or cerulean! I have to say, I love that Rose sofa. But then I have a thing for wheels on furniture and I do tend to lean more traditional. Lookin’ good!! I would LOVE the Crawford in Ash or Robin’s egg. Looks very comfy but still sleek and modern. I love the sloan couch! Perfect for my family room. Slone in leather. Pet safe and kid safe=beautiful sofa for years. Great first post Brady! I agree that the ROSE sofa is the way to go. Both for your space and my imaginary living room. Look forwards to seeing how your space turns out! Hmm I forgot to post the link! Can’t enter the contest without that. What is the paint color you have on your mood board? I have been trying to pull ideas for my family room together & I love your paint choice! I’d pick the Lucy sofa! I am loving the Walters sofa and that huge chaise! I’m into the Harper sofa! Rose in Midnight Blue, pretty please! Love, love, love the Sloan in Tumeric! I feel your pain about decision making. I’ve been obsessing about white tile for a 2nd bathroom remodel for a month now. A constant battle between the practical (use & cost) and the pretty ($$$). It’s exhausting! Although I love the style of Rose, I have found that it’s not a good upright “sit”. Meaning the slant of the back and the length of the bottom cushions forces a reclined sitting (needs propping up with pillows – even then you can be in recline mode). Unless of course all your BFFs are over 6 feet tall with legs to heaven then go for it! I am loving the Owens in Ash! Can’t wait to see your apartment come together! If I had $1,000 to spend, I’d get the Sloan loveseat in tumeric for my breakfast nook! It’s hard to choose but I think I’d go with the Henry in coral! I really like the Gray sofa in Robin’s Egg New Felt. Love the Sloan sofa in Storm, or the Lucy sofa! Oh man, I would Love to win this beauty and finally replace my husband’s overstuffed college sofa…. I love the Alice swivel chairs. A pair of them would be gorgeous in our compact living space. Hit me up with the Harper…in the pebble color. I wish there were a navy blue option! I have to say I’d also choose the Rose sofa, probably in the Flint colored linen. It’s such a classic shape to mix in with more midcentury lines. Thanks for introducing us to a great new affordable furniture source! They’re all lovely but I love love love the Rose in Stone. To win this would be so awesome as I’ve been saving up for a sofa for sooooo long and still haven’t quite pieced the pennies together to get something of quality. I love the Rose sofa in coal. I love the Sloan couch! Oh dear. I need the Henry sectional (in Zinc, please) in my life. Stat. Excited for this new series of posts! Hi, Brady! The Rose would be my pick too–I checked out Interior Define before scrolling down to see where you were going with your living room (have to agree, it looks like the perfect boyfriend). That Henry sofa is just calling for my kids to climb all over it! I love the Lucy sofa! And the Rose that you picked- can’t wait to see how it looks in the space. Love the direction the room is going! It is such a small world that I am actually going to the Chicago showroom to look at their sofas 🙂 We are in need of one so bad … and I am leaning towards the Gray or Sloan in Steel. There are SO many good ones to choose from though!! I think the Rose is my fav! I love so many of them but we need something bigger so I would go for the Ainsley. Not sure about the fabric – so many choices! Lucy in charcoal, definitely. My eye just kept going to it, love at first site! Our almost 2 yr old Golden ate our other sofa but he has manners now and we can have a new sofa. Whoop! Oh the Sloan sectional please in a super soft grey velvet! or a dark blue. . . can’t decide. This would be perfect in our living space! I love the Rose sofa in midnight blue! Hi Brady, I always loved your behind the scenes posts…. And now you’re back! Well, I really like your style , its more serious and moody than emily’s. And I’m excited to follow your journey. P/S –tell emily to bring back the critique of readers’ home photos. I really loved that and she only did it once or twice. I think that’s really good (hopefully not time-consuming) content. PP/S — please also tell emily that if the blog ever goes DARK and she closes up shop, I will die. Just die. I am already picturing myself lounging on the Kelley sofa with left chaise, in that beautiful midnight blue. Brady and I need a couch for the same reason–so many horrible first dates. Need somewhere to cry. Waah! Sloan in leather with left chaise, I think in night. I ordered the fabric samples to see which I prefer! Would love the Asher in Heather or Blue. it looks amazing! Loving the Kelley Sofa in Natural! I love the clean lines of the Sloan sectional sofa. The “GRAY” sofa has my full attention in the Granite. Wowza! My $95 consignment sofa isn’t cuttin’ it anymore. Bring on a Scandal marathon with that comfy beauty. I would buy the Asher sofa! Love the Rose! I’d probably be safe and choose the more neutral natural color, but I love the cerulean blue too. Oh my, a hard decision but I love the, Harper in Linen. I LOVE the Harper! They’re all beautiful sofas. My fiance and I currently have an old pleather couch from a friend of a friend. We’re looking at buying a house together in the coming months and would LOVE this classic sofa. I’d like to be able to invest in a few quality pieces at the start our life together 🙂 I think the dove or zinc would be perfect for the color palette I have in mind. I too would pick the Rose sofa! My pick would be either the Henry sofa with the chaise OR the Walters sofa for our living room…um…so hard to pick! I would probably choose the Harper in Zinc! I LOVE the Owens sofa. I love the length of the Harper in Dove! I love the Gray sofa with uneven arms, in robin’s egg or coral. Thanks for the contest ID, EH and Brady! I love the Lucy Sofa in the steel color! It would be my first big-girl furniture purchase and I think it is perfect! Modern and traditional in one! the Gray in chartreuse (er, turmeric) is calling my name!!! That Sloan sofa with chaise is beautiful and would make the living room in my new house my favorite room! I love the Harper sofa in Dove! I’ve been needing a new sofa for so long! Our current one is a 12 year old boring beige microfiber sofa with water stains! I LOVE the Sloan in Cerulean Blue! I’d go for the Kelley! In Zinc. My current sofa is faded. I need the Sloan with right chaise in Cerulean Blue! i REALLY REALLY hope i win this – we have been in our new house for a year and i still have no dining room furniture! (the dog loves that room so much). i would choose the rose sofa! love the curved back. My favorite is the Gray sofa! THE WALTERS SOFA IN OCEAN!!! We currently have a futon for a “sofa” – keeping my fingers crossed! Can’t wait to see how the living room turns out, Brady!! Brady – digging this vibe, big time. Can’t wait to see how this all comes together. xo from Mpls. And yes, I had to enter, because HELLO GORGEOUS. I’d do this couch to replace our hand-me-down R&B one; tin seems to be my first choice which is why I might need to aim for ocean. I love the Crawford sectional in Dove. I would order it in a heartbeat!! Love the Rose sofa in dark blue! Love the rose sofa. Would probably go with graphite or citron. Harper! 102″! Perfect for our family of three. The Sloan!! Simple clean lines, love that it sits up off the floor, and best of all — perfect dimensions for our limited sitting area! We have a tiny 53″ C&B loveseat right now that no longer fits our style and never actually physically fit my husband, but did fit into our previous tiny living room. We have a bit more room now, but still not enough for the usual 87″+ sofas. But we could definitely do a 71″ Sloan that would finally let him stretch out a bit! Kitties would probably dictate the Performance Felt, and the Heather color would be great for our new look with grays and woods and pops of color. I’m loving Brady’s mood board — can’t wait to see what comes next!! The Alice swivel chair looks so comfy. The Walters. I have been stalking it for awhile now. I like the Rose best for my house. In cerulean blue. But if I was starting over, I could go for some of the modern-styled ones, for sure. I’d get the Henry in zinc. We need a comfy sectional for TV watching. This would be perfect. Great post Brady and Jessica. Look forward to going on this journey with you. SLOAN, love the modern look! I would totally go for the Lucy sofa. So chic and comfy looking! The Kelley in “Ruby” is Mad Men level gorgeous. And I think it would look just right in my modern studio. I’m so in love with this sofa- crossing my fingers and toes! Love the Rose sofa, but…..
A pair of Alice swivel chairs by the fireplace? Heaven! But a pair of Alice swivel chairs by the fireplace? Heaven! I’m with you, Brady. The “Rose” is a classic. Good call! Definitely the Rose sofa in the Century Gravel fabric! Beautiful! Love the fabrics and the prices! Gotta go with a 3-cushion sofa in my house so Lucy would be my choice! I love the Rose in a gray fabric and would give it to my Dad who after having 7 kids can use something nice & new! I love the rose sofa in cerulean blue. I’m surprised by it, but I love the Rose sofa too!! The Ainsley sectional in midnight blue is stunning! So many pretty choices though. I live in Chicago and am also on the great sofa hunt- this is perfect! The Sloan and the Owens are calling my name. I think a trip to the showroom may be in order. Loving the Henry with chaise in Tin! Ohhhh man. I LOVE the Rose sofa. Like really, really love it. But I would probably choose the Crawford because I need to replace my existing sectional in my huge living room. I’m really loving the blue. Brady, you’re off to a great start. Sophisticated. This would be my choice, for my house. The Lucy in steel gray would be lovely in my living room. I have dark blue walls that would look awesome with that! The Rose sofa is my favorite. Although more traditional in style the fabric choices definitely give it a more modern edge. Anyway, I like where you’re going with your choices and I’m looking forward to following this project along. I love both of your design boards, but I prefer option 2! I would purchase the 111” length Walters Sectional in Natural. However my color selection might change once seeing the fabric swatches in person. The rose sofa in coal is my fave. The Rose sofa in Midnight Blue is my favorite. I love the Rose sofa and have had my eye on it for quite some time! I hope I win because I need to buy a sofa within the next week! I would love the Lucy! My mom needs a new sofa for her living room, and I think this would be perfect! This giveaway couldn’t have come at a better time. I am in desperate need of a new sofa… all Ikea pieces over here!! I went to the website, signed up and reviewed all their pieces but I also kept coming back to the ‘Rose Sofa’. I love the lines and better yet, the dimensions of it with the height being 33″ will mean that it will come below my bay window – a big plus!! I don’t like it when the height of the back of a sofa blocks the window. The other reason I love this sofa is the back is solid and attached and this keeps the shape of the sofa back looking good for years to come. i like the leather sloan! love the Asher in Evergreen! I like the Sloan chair! I would most definitely choose Rose in Sand Linen. Love Craigslist, but could definitely use a non CL/”curb alert” sofa!! Not only does it look crazy-comfortable, it has the all important feature of lovely legs elevating it and creating a hidey-hole space gap beneath the sofa. Super handy for a tray to hide remotes, the cat’s hairbrush, or anything else you don’t need out ALL the time! Agree that it does have a femme vibe, but you can man it up with a wool blanket throw, and pair it with more rugged end tables or coffe table. Looking at the Sloan, would be nice! I love the look of the Sloan! In love with the Rose sofa! It would look so amazing in our farmhouse. Fingers crossed! Love the look of this shop, the Harper would work so well in our living room! Agree that it does have a femme vibe, but you canit up with a wool blanket throw, and pair it with more rugged end tables or coffe table. Brady, I would choose that exact same sofa! Thanks for the chance to win! All so beautiful! Especially the Sloan! Walters, for two reasons. A) it’s a terrific couch. That’s important. B) my dog is named Walter, so when we get questions about the couch, I’d say, “oh! That’s Walters.” Missing an opportunity like that should be criminal. The Sloan is the perfect piece for our family room!! If only the Rose came with a chaise! Asher couch is my favorite! Rose in Cerulean Blue is a dream! It would look great in my nightmare of an empty living room. Love all the sofas, but I would have to pick Sloan Fabric Sofa with right chaise! I love the Rose sofa. I do wish it came in velvet, but the linen looks lovely. I would hoard the leather Owen in Boulder so hard. I NEED IT!!! This Sloan sofa slays me! I’d go for this in Cerulean Blue and be a happy camper. I love the Rose sofa – it would definitely be on my list as well as the Alice Swivel chairs… Tough decisions!! Hard choice! I’m thinking the Kelly would work best in our home. Thanks for the giveaway! The Lucy couch which I could sit in while I marathon through back to back episodes of I Love Lucy! Overkill? I think not! I would get this fantastic minimalist sofa with high arms in Ocean: http://www.interiordefine.com/gray-69#NT-62893-9 I love how chunky and modern it is. It would be a great video game thrown for my partner. I have always wanted an english roll arm sofa! So I would definitely chose Rose. This would be great in my new home! So many good ones, it’s hard to choose! I think I like the Lucy the bast. I love the Rose, but I need something with a higher arm. Looking forward to seeing what you do, Brandy! I love your mood board! Oh man, I’ve been eyeing the Sloan with the chaise for some time now. My fingers and toes are crossed! Love this new Makeover takeover series! Eep! The link didn’t paste. http://www.interiordefine.com/shop/sloan-chaise-rt#NT-6013-8 My new house with the 90’s hand-me-down overstuffed (but lacking stuffing) couches, are counting on me to get this right. Love how comfortable and minimalist the Gray fabric sofa looks! Hoping they have an alternative down fill! The Sloan chaise with Left Chaise would be my pick! It would look (and feel) so good in our den where right now we’re using an old wicker patio set handed down from a friend. I think the gray would work best in my space. Gorgeous! I love the Rose as well – gorgeous! Sloan sofa. Thanks for the giveaway! I love the AINSLEY FABRIC ACCENT CHAIR in natural. First, Brady, I loved this post! I can’t wait to see what you do with your room. Second, I’m kinda crushing on the Sloan in Cerulean Blue. I would use it to replace the world’s most tragic slip covered couch that I bought about 10 years ago during a momentary lapse into Shabby Chic. The first time I tried to wash the slipcover it shrunk massively and now looks like me anytime I try to put on my pre-pregnancy skinny jeans. Tragic. We suffered a house fire and we are rebuilding. The only good news is that we get to choose new furniture. I fell in love with the Asher couch with the chaise on the right. It would be perfect in my new livingroom, and would set the tone for the whole house as soon as guests arrive at the front door. I’ve sent away for 4 color swatches. I adore the Rose sofa! Especially the legs. We’re looking for a new sofa right now because our current sofa is too deep and hurts my back. I love the Lucy sofa because it’s shallow and has modern lines that will look good with Mid-Century furniture or a more modern mix. Graphite would be the color, thx! I love the Walter sectional. It would look amazing in my family room. Going to order fabric samples and try to convince my husband. The Rose sofa is definitely the most my style! Love so many, but I think this is my favorite! Kelley sofa in midnight blue for me please! Brady, that Rose sofa is everything I’ve dreamed about. If I won this thing (please pick me!!!) I’d order one of those suckers in a nice linen immediately. So can we like make this happen? I love the Asher sofa! Love the Sloan sofa with the chaise! My favorite piece is http://www.interiordefine.com/shop/rose#NT-6013-4 in Flint! This is a timeless style! Would blend with so many different design aesthetics! I love the flint color because it is neither a cool grey or a warm grey. It is an ambiguous grey in the most beautiful sense of the word. Would love to own a piece from this new company! I think the Lucy sofa in Steel is pretty rad! I’m loving the Rose sofa in blue! I would go for the Rose sofa in one of the pale gray options. first off, i love your mood boards and can’t wait to see how your makeover turns out! these sofas are all gorgeous. i’m about to move in to a little venice bungalow. with my man for the first time and we need all new everything. i’d start with the sloan in a slate grey! gorgeous. I’d get 2 of the Sloan couches for my library. these sofas are all gorgeous. i’m about to move in to a little venice bungalow. with my man for the first time and we need all new everything. i’d start with the sloan in coal! I love the Harper in Midnight Blue. Sorry I forgot to include the link. I’d buy the Harper! Been loving it for a while. I’m digging the Crawford (we like a nice big sectional to stretch out on), so that’s what I’d use my credit towards…if my head didn’t explode from trying to choose between fabrics! I really like the Asher but with my large family – we’d probably need the Crawford! This would be fabulous to win! My husband recently got out of the Army and we moved from Texas back to Oregon. Before we left Texas though, we sold all of our furniture to make the move easier. One of my favorite sofas is the Harper 102″ Fabric Sofa in either Dove or Linen. Thank you for the opportunity! Brady, you’re still single because it takes a while to find someone worthy of your awesomeness. Don’t worry, I’m sure he’s out there. I am totally in love with your inspiration and mood boards for this room. This is the look I love and yet I somehow always go careening off into super happy fun color rooms. What can I say? My inner 5-year-old loves bright colors. However, this is giving me ideas for a bedroom redo. That room gets a ridiculous amount of light and could handle the dark colors. I’d love to have the Sloan (http://www.interiordefine.com/shop/sloan-chaise-rt#NT-6013-8). I think it would be perfect! The Crawford Sectional for all my leisurely needs. The GRAY in graphite with asymmetric arms would look great in my space. This Ainsley sofa (in Midnight Blue) would be perfect in our family room. I can envision it being the perfect place to snuggle up and watch movies and also the perfect place for our toddler to jump all over. I love how the simple classic lines will blend seamlessly with the other pieces we already have. This was fun, even if we don’t win, to spend an hour daydreaming of room makeovers. Thanks EHD! Totally digging the Harper sofa. Now that my little one is cruising, I’ve got dirty finger prints all along my off white sofa! So I think Navy might be in order… And I’m a sucker for a tight back. Hello, Rose! I would get the Sloan sofa, I think. Definitely one with a lounge section! Love the look! I also think the gray in turmeric would be amazing. I’ve been interested in sectionals lately, and their Henry sectional looks like the perfect piece for my living room. Rose sofa or Sloane sectional. It’s a hard pick! Swoon! I love the Rose sofa in Coal! I’d spend it on a Sloan fabric sofa, but I’d order it in Flint linen. It’s sleek, and the legs really keep the room open. That shade of grey with a hint of texture from the linen will rock with anything, especially a Bohemian-Industrial look. Love that Harper sofa. Would look fab in the new house I am buying in December! I love the Walters fabric sofa with right chaise! The Rose sofa! In the beautiful dark blue. The perfect sofa for husband, cats, and puppy! Thank you Emily, Brady, and Interior Define. Loving Asher, what more is there to say. The Lucy sofa is exactly what my family of five needs. Love it!!! i would get the Owens in Tin – or if they offered lighter leather options, I’d be all over that too! LOVE the Harper Sofa in Dove! Also, what an awesome new company! I am loving the Lucy sofa. Though it is hard to make a decision, so many fabulous pieces! LOVE the Sloan in one of those dark blues! This is serendipitous! Like you, Brady, I’ve been trying to navigate the endless sea of options and swatches on my sofa hunt, but finding Interior Define here (and learning that they have a showroom here in Chicago!) is perfect timing. I’d go with the Rose, in Cerulean Blue. Love those rolled English arms. Oh, the sloan in cerulean blue would be my choice. Also – can I volunteer to be your Chicago correspondent? I’m so excited that FINALLY one of the awesome places you talk about on this blog is in my city!!! The Owens sofa in Ocean Blue. Lovely. I want the Walters sofa!! great combination of comfort and clean lines! i love the rose sofa and the alice swivel club chair! I love the Sloan fabric sofa in robin’s egg. It’s a classic silhouette with pop of color. It would look awesome in my living room. http://www.interiordefine.com/shop/harper#NT-3335-21 Hands down, Harper in Dove! http://www.interiordefine.com/shop/rose#NT-6013-8 The Rose all the way. Just something about those legs. Can’t decide if I would get it in Graphite or Coal. I’m into the Lucy sofa or Sloan accent chair. Thanks for the giveaway. I would buy the Gray Sofa in tumeric! I love the Asher with the chaise! Oooh, Sloan in ocean, please! Or maybe Turmeric. Whichever color would show toddler snot trails the least. Lovely stuff. I’d go with the Ainsley with a chaise. But that’s a tough choice. I love the Sloan couch. It would be perfect in my mini sized living room! I’m loving the Rose sofa in the Century fabric in gravel … we would be very happy together! I would definitely go for the Lucy in Cerulean. Gorgeous! Fantastic idea Emily & team! I am so pumped for the makeover takeover! Loving those pretty legs on the rose sofa in gravel. Bow-chicka-wow-wow! I love the Asher sofa in the Cerulean Blue! I used Interior Define for my living room sofa in my own home and am very pleased with them. I got the Sloan sofa and it’s very comfortable. Fabric samples and customer service were great, as well as the price! I would love, love, love the Rose sofa in basketweave for my new home!! Your room is coming along, Brady. Love you choice of sofa, and I think it looks great with all of your other inspirations. I look forward to more posts on your progress. What fun! I love decorating! I love the Rose sofa! All of the colors are great, but I think the Cerulean Blue is stunning! I’ve had my eye on the Kelley sofa! It looks like the perfect sectional for our new living room! I love the Sloan sofa, it would be perfect for my living room! I would get the Henry in the BASKETWEAVE 2 graphite color- looks so comfy and stylish!! I think the Rose will have to be it then. I like the Sloan sofa. Nice, simple design that would work in many settings. I love it’s clean, simple but modern look. All my fingers crossed!! I love Lucy in Charcoal! I really love the Rose sofa in Cerulean Blue! The Rose sofa is beautiful!! I’m torn between the Gray and the Rose, but I love how the Rose hearkens a bit more to a feminine feeling. I would pick rose sofa. I really like Harper and it’s my friend’s grandson’s name. Win/win. +link (and apologies for replying to your comment, Mary Ann, vs. posting separately). I like the Harper in Coral! Rose in. Cerulean blue would be amazing! I LOVE the Henry sectional! We are in desperate need of a new couch and that one looks amazing! Harper for sure! Love it!! I’d love the Rose in blue! Rose, in cinder 🙂 Love Interior Define! http://www.interiordefine.com/shop/rose#NT-6013-4 I just love that rose sofa- that’s the one is go for for sure! I think the Lucy in steel would be Perfect in my home! I’d buy the Asher sofa in Heather! Shopping for a sofa right now, what timing! Loving the sleek Owens with chaise. Interior define Harper sofa looks stylish and comfy. For those living in Europe I can highly recommend sofa.com. Their website is easy to use, fantastic choice of products and fabric and the whole delivery and assembly process went smoothly. As I live in a Victorian conversion I was anxious about getting my new three seater sofa bed up the staircase and through the front door. I needn’t have worried – it fitted in perfectly. Thanks so much for the opportunity!!! The Rose sofa in graphite would definitely be my choice! Oooh, the Lucy sofa in Cinder! It was hard to chose! I really like the Sloan Fabric Sofa with a chaise in cerulean blue. Love the Henry and the Rose! I put the link in the wrong place! Wow, what a great space! The Asher couch at Interior Define is far and away my favorite. I love the rose in heather! Oh, the Sloan in graphite! Harper! Clean lines, large and comfy! The Lucy in Steel. So good. Awesome sofas. I would so love to buy the Harper! I was torn between the Rose and the Lucy, but the Rose won due to the tight back. I love not having to fix loose back pillows, and it would look neat all of the time. I hope to win…fingers crossed. http://www.interiordefine.com/shop/rose#NT-83016-51 I like the flint. I adore the Rose sofa and am excited to see they have added more choices! I adore the Rose sofa and am excited to see they have added more choices! Thank you so much for the giveaway! I love the Sloan in graphite or cerulean! The Asher sofa is gorg. I’m moving into a tiny apartment and the Sloan in a linen blend would be perfect! LOVE LOVE LOVE this sofa!!! First time I’ve seen this company!! Thanks for sharing!!! I love the Crawford in Dove. So hard to pick, so many amazing pieces. Awesome giveaway! Interior Define is really nice. I would have to go with the Sloan. I love your style ever since HGTV design star! You’re super! I also love the Ainsley couch by interior Define. I love the Owens sectional! I’ve been eyeing the Sloane sofa for a while. Graphite would make the perfect finish. Alice swivel chairs x 2 please. This piece would change the whole dynamic of my mom’s living room (her current sofa is quite Victorian and she’s longing for a new one)! The Rose sofa is lovely! That would be my pick! Definitely Asher! I love it in the blue color.